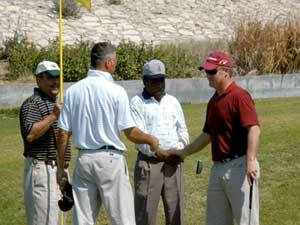 DHAHRAN – The 2005 CEO Cup Golf Tournament was held on Thursday, February 24 at the new Rolling Hills Golf Course in Dhahran. A total of 176 golfers from the Eastern Province and as far away as Yanbu participated in the tournament, which was sponsored by the Saudi Aramco Golf Association (SAGA). Rolling Hills Country Club played host to SAGA Member Clubs: Ain Nakhl Golf Club in Abqaiq, Ras Tanura’s Surfside Golf Club, Wadi Al Saeed Golf Club in Udhailiyah, and Yanbu Golf Club. This year’s CEO Cup was noteworthy because it was the first year that the tournament was played on the new grass golf course in Dhahran. The par 72, 6141 yard course was in excellent condition for the tournament, despite wet and cool conditions in the morning. In order to accommodate 176 golfers in a single day, shotgun starts in the morning and afternoon were necessary. 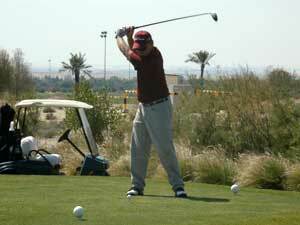 For many golfers outside of Dhahran, playing on a grass course in Saudi Arabia was a new experience. Perhaps the highlight of the day was one of the rarest feats in all of sports…the hole in one. 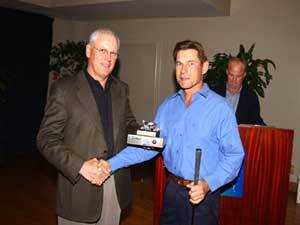 The 2005 CEO Cup featured two aces. The first occurred on the first shot of the day by Rolling Hills member Mike Haas in the morning group, who holed out the #5 179 yard par 3 hole. That was followed in the afternoon by a hole in one on the same hole by fellow Rolling Hills member Dennis Niemeyer. The day’s activities were concluded with an awards ceremony and dinner at the Ad Diwan Building. The guest of honor, CEO Abdullah Jum’ah, presented prizes to the winners in five men’s flights and one ladies division. Mr. Jum’ah addressed participants and guests and remarked on how the new grass golf course became a reality, and the importance of golf in the Saudi Aramco communities.